Japan’s vice-minister of Economy, Trade and Industry meets with Iran's Minister of Industry, Mine, and Trade on 09AUG15 in Tehran. 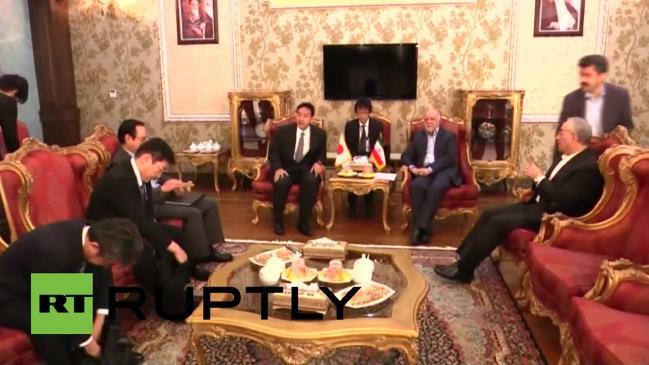 Iran's Minister of Industry, Mine, and Trade Mohammad Reza Nematzadeh and a high-ranking Japanese economic delegation, in a meeting in Tehran, stressed the need for closer ties in various fields, including automotive and rail industries. In the Sunday meeting with the visiting delegation headed by Daishiro Yamagiwa, Japan’s vice-minister of Economy, Trade and Industry, Nematzadeh voiced Iran’s preparedness to promote mutual cooperation with the East Asian country in diverse spheres. The Iranian minister further emphasized that Iran is ready to cooperate with the Japanese companies in rail, automotive and telecommunications industries. The Japanese official, for his part, said Tokyo is willing to boost economic relations with Tehran in various areas after the termination of anti-Iran sanctions. "There should be durable and continued process for the expansion of cooperation," Yamagiwa stated. COMMENTARY: Japanese interest in developing post-sanctions economic ties comes following high level official visits from Germany, France and Italy. The Iranian foreign ministry has stated it expects in the near future high level official visits from Spain and Switzerland. Farhang Jahanpour states "The Nuclear Deal has turned Tehran into Diplomatic Capital of Mideast"
Why is the Japan’s vice-minister of Economy so nervous? Which country will make a better lead trading partner for Iran , China or Japan ? Gents this looks to be just the beginning. Sounds like Iran is favoring the Japanese and even EU businesses to get into Iran over Russian and Chinese. Just today I was reading that U.S. Automakers are already in Iran via FIAT as a JV. Mullah's seem to be looking the other way on this. Same with now openly preferring Boeing/ Airbus over the Sukhoi Super Jet. How bizarre? We shouldn't embrace the regime with financial deals until it substantially improves its human rights record .Entering into lucrative financial deals with countries of dubious human rights doesn't usually turn out well for the cause of freedom and democracy :just look at Saudi Arabia and UAE .Hardly anyone can argue that our long-term objectives can be served by embracing states that harbor and support terrorists . It may be argued that there are two choices facing Iran diplomatically :first , to be very much pro-western as during the Pahlavi dynasty . Or to linger , as it does now , in the anti-western orbit in league with Pakistan, Syria or Hizballah for example .As we may all agree, the latter posture has turned out to be a disaster for Iran, for its people and for the region as a whole . Perhaps there is an alternative or a third option : for Iran to move away from its current terrorist-friendly policies and be more firmly anchored with Russia and China , thus preventing a relapse. Admittedly that's a far from perfect strategy , but decidedly preferable over the disastrous last three and half decades . The challenge is how to contain a terrorist-supporting state with an awful human rights records, without alienating its young and aspiring population .Haphazard financial deals here and there may not address either . sq why this 'website' is using RT Ruptly news instead your prefered EU, US and Japanese sources ? Its probably because the europeans are offering the very best deals in an attempt to try and regain all their lost opportunities in the iranian market,besides its not like russia showed iran much loyalty so why shouldnt iran go for the best economic deals they can get,if russia and china want a slice of irans economic opportunities they need to offer better deals than the europeans/se asians thats just simple economics,if irans smart it`ll play both sides off against each other to see who can give it the best deal.